After about five years of active duty with the Hailey Police Department, Shadow the drug dog is retiring. The 11-year old Labrador retriever was sold for $1 to his handler, Sgt. Derek Stewart. “This is a customary practice since the dog and handler develop a relationship while working together,” said Hailey Police Chief Jeff Gunter. Since 2007, the K-9 team of Shadow and Stewart has been a visible presence in the southern Wood River Valley. Both crime fighters were originally part of the Ketchum Police Department. Shadow’s K-9 patrols and traffic stops uncovered one methamphetamine stash and several stashes of marijuana. The methamphetamine bust took place in 2011 following a traffic stop for “erratic driving.” Shadow took a sniff and signaled to police that drugs were in the car. Shadow also assisted police in uncovering marijuana at Wood River High School and elsewhere in the city, leading to misdemeanor drug-possession charges. 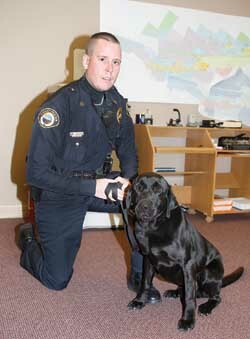 Shadow was thanked formally at a Hailey City Council meeting last week by Mayor Fritz Haemmerle for his duty to the city, before taking his leave with Stewart. Shadow’s counterpart, Dax, is a drug-trained dog on active duty in Sun Valley.